When you're dealing with heavy-duty materials, you need heavy-duty equipment. Whether it's metal, concrete or timber, you'll want the best electric tools to help you make quick work of tough materials and get on with the job at hand. It could be that you're doing a little bit of DIY paving and you need to break up the existing layer of concrete before laying a new one on. Or perhaps you're hoping to cut off rusted bolts or fence parts, but your existing tools can't handle the job of slicing through the metal. You could even just be hoping to do something as simple as polish a car or remove the dirt from your tools after that garden DIY job. Drills, breakers and hammers - oh my! Whenever you're planning on building something new, there's a good chance you'll have to remove an existing structure. This means demolishing the existing surface layer, whether concrete or tile, so you can make your renovation. If you don't have the right tools for the job, this can be a time-consuming, even impossible process to carry out. Fortunately, Kennards Hire's range of drills, breakers and hammers can make any demolition a job as easy plugging in, turning on and holding firm. Kennards breakers range from 10kg for smaller projects to 33kg for medium-size demolition that will see you breaking through concrete like a knife through butter, as well as cutting bitumen, digging up clay and lifting tile. For those needing to break concrete at ground level, break up asphalt or any other kind of heavy demolition, our heavy breaker can break up to 6 tonnes of concrete every hour! Our arsenal of drills includes everything from smaller drills for precision work with timber and steel, to hammer drills for masonry, brick and concrete drilling. We can even hire out diamond-tipped core drills to bore holes through concrete. It doesn't matter if you're a road worker needing a tool with the gumption to penetrate asphalt or if you just need something to help with renovating the bathroom - our extensive equipment options mean you're sure to find what you're looking for. If you're installing a new tiled surface in your kitchen, trying to reinforce concrete or dealing with rusted steel or other types of metal, you're going to need a variety of tools at your disposal that are built to handle these materials. At Kennards Hire there are plenty of options available to you, no matter if you're dealing with concrete, metal or timber. We at Kennards Hire know the wide variety of materials out there, and that each variety has its own subcategories of strength. That's why we can offer you everything from hand saws and drop saws to tile cutters and wood planers, so you can find the right piece of equipment for your particular, unique job. When the work requires a little more finesse, our line-up of sanders and grinders can help you cut, trim and grind for surface preparation or maintenance of different masonry products. You can use a concrete grinder for a bit of light demolition or perhaps sharpen a dull blade with an angle grinder. You can even use it to score a tile face as part of some bathroom DIY, letting your tile easily fit around obstructions like outlets and light switches. If you're using rebar to reinforce concrete, build a fence or one of its many other numerous uses, then our electric rebar cutter will cut, bend or do just about anything to it with minimal effort - giving you time to get on with other work. Whatever the job, and whatever the circumstances, Kennards Hire has you covered. For the DIY enthusiast and the professional alike, painting needs to be done perfectly. It's the part of the job that everyone notices and a poorly executed paint job can be hard to live down. On the other hand, a crisp, fresh coat of paint can enhance almost every project. Kennards Hire has everything you need to guarantee your paint job earns you the praise of every person that sees it. One of the most important parts of any paint job is ensuring you have the right equipment at every stage. If you have the right equipment to prep your project, to do the job itself and obviously clean up afterwards, then you know you're bound for success. If you are unsure of what your specific project might need, make sure to stop in at your local Kennards Hire to discuss what you're working on. Our experts will be happy to help you plan out your job ahead of time by making sure you have all of the equipment you may need for your various tasks. If your tired villa needs a bit of a facelift, Kennards Hire has the equipment to make sure you can get the job done. Make sure you consider access to all areas to be painted - will you need a ladder or trestle for those hard-to-reach places? Before you tackle the interior, will you need to do some wallpaper removal? Do you need to remove paint from doors, mantels, sills or exterior wood surfaces? If painting is something you do more than a couple times a year you know that the big jobs need some extra assistance along the way. Kennards Hire has the help that you need. If you're worried about completing something on schedule, consider heat lamps for shorter drying times. If your job requires the ultimate in efficiency and consistency, maybe the old paintbrush isn't for you. Spray painting can be a quick and effective way to evenly apply paint for commercial projects, or even the bigger jobs around the house, like painting a fence. Spray painting will also ensure better coverage and penetration into those tight corners. Need to demarcate your car park? Paint an entire factory hot pink? Kennards Hire has the equipment for large-scale projects. Spray painting will make quick work of those big blank canvases, and our line marking equipment will get your car park or factory floor in order again before you know it. Refinishing a door? Painting the roof? Marking out the goal line at your local sports field? Doing the body work on your project car? Kennards Hire equipment has what you need to get the job done. If you're not sure what you'll need, the good people at your local Kennards Hire branch will be happy to offer advice and make sure you have all of the right tools at your disposal. There are always hidden complications to any job, and you can rest assured that your local Kennards Hire will be able to help you out with the right tool at the right time. And remember, hiring equipment can be a very good way to keep the overall cost of a project down. Lower costs mean a more profitable job, or getting the go ahead for that DIY project from your partner. There's nothing quite like smashing concrete, and at Kennards Hire we make sure you have exactly what you need for demolition, renovation, roadworks or anything else you can think of. Hammer drills are great for getting into masonry, concrete, brick and most other tough surfaces. To make sure you have the right tool for the job, Kennards Hire has a range of different sizes and options available. For smaller jobs, a cordless hammer drill with a 13mm chuck provides versatility and easy access for overhead or hard-to-reach jobs. You'll also need some chisels and points for minor chipping and other uses. If you need to step it up a bit, but still want to move around, there are 26mm chuck drills available for larger holes, and they're also great for masonry anchors. 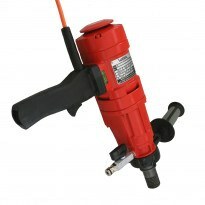 If you need a lot of hammer drilling power and can't afford downtime to charge a battery, electric versions are available with 8-20mm chucks. 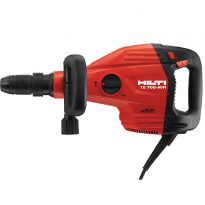 If you need light and manoeuvrable, but still want a hammer action, the Hilti cordless drill provides an excellent power-to-weight ratio, helping you to get the job done. Its 36V big brother has a rotary hammer and a battery that just keeps on giving. Ergonomically designed, it's very easy to handle. The Hilti range available from Kennards Hire includes light and medium demolition hammers, as well as light and heavy rotary hammers. You'll have all the power you need to take down that wall in no time! For big jobs like roadworks or or significant renovations, a jackhammer is probably what you have in mind. Jackhammers, or breakers, are incredibly versatile tools, and can be used for breaking up large concrete pads, digging through clay, carving up rocks - you name it! Our range of breakers will suit any application. We have electric and petrol options available to meet your work environment needs. Electric breakers come in 10kg, 15kg and 33kg sizes, and are suitable for concrete thicknesses of up to 50mm, 100mm, and 150mm respectively. 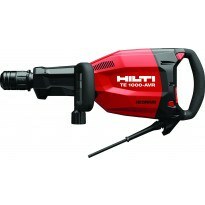 The Hilti heavy hammer breaker weighs in at 29.9kg, and delivers an impressive 860 impacts per minute, allowing you to get through up to 6 tonnes of concrete per hour. It is small enough to throw in the back of the ute, and can be easily transported to small or infrequent demolition jobs. They can all be fitted out with a range of bits, including: points, chisels, asphalt cutters and clay spades. Our petrol jackhammers are able to cut through concrete up to 100mm thick, and are great for work locations that are far from power sources or generators. With its one litre petrol tank, you know you'll be able to get through a whole lot of concrete before you have to stop and fuel up. 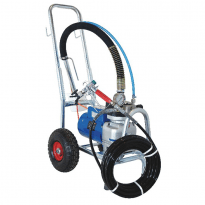 Hydraulic power packs are a great alternative to air compressors, and can power a hammer that will dig through concrete with a 100mm thickness, with impact equivalent to a 33kg pneumatic hammer. The jackhammer trolley is ideal for flooring and surface preparation, and allows you to work at angles that would usually be hard to achieve, creating a more versatile tool. It makes a tough job a little less tough by absorbing some of the vibration. With more rock-breaking, concrete-cutting, clay-digging power than you could ever need, the good folks at your local Kennards Hire store will be able to sort you out with the demolition and renovation tools you need. Whether you're a mechanic, sheet metal worker, factory fitter or you work on the railway, there are plenty of times a welder is just what you need for the job. Everything from aluminium extrusion to marine grade stainless steel has its day in the workshop, so if you find you don't have exactly what you need, when you need it, you need to talk to Kennards Hire. There are plenty of options to choose from in the range of welders and plasma cutters at your local Kennards Hire store, suiting everyone from the DIY tinkerer to the hardened professional. Whether you are joining aluminium, mild steel or stainless, Kennards Hire has you covered with a welding option to suit. Gas and gasless options mean that even small jobs in the garage or shed can be done easily, while heavy industrial work is catered to as well. For the DIY weekend warrior there are light options, such as a 130 amp gasless MIG welder or 130 amp inverter type arc welders. Perfect for fixing the exhaust pipe or getting creative with scrap metal, you'll find endless uses for these versatile machines. If you're thinking of something a bit more heavy duty, or have a complex fabrication job to complete, you can't look past Kennards Hire's brilliant range welders. Oxy/Acetylene welding kits are brilliant for industrial applications, and include a cutting torch as well as welding tips. Kennards Hire carries a good stock of arc welders and MIG welders, including big 420 amp units with remote feeders and three phase power. With this kind of welding power at your disposal, you'll be getting even the toughest of jobs done with ease. Plasma cutters are also available for when you need to cut thick sheets of steel, even at awkward angles or when producing irregular cutout shapes. If you need to tote your gear around a job site, then you know what it's like trying to find reliable power and access for any hot work. To make life easier for yourself and your crew, have a look at a welder generator instead of plugging into mains. Not only do you not have to fight with other subbies for access to power outlets, you won't be restricted by the length of your power cord, and can move about the job site freely. If you need serious grunt, a 380 amp silenced diesel welder could be right up your alley. And if you're really not mucking around, there's a 500 amp diesel fuelled welder as well - with a 12 hour fuel tank capacity, you can go all night long with this big guy. For the small jobs here and there, consider the Oxy/Acetylene set up for convenient welding and cutting on the go. If you spend most of your day working on rails for trams, trains, gantries or other vehicles, then you need some serious welding power. Before you get too far ahead of yourself though, grab some A-frame aligners to keep your rails in place for quick and easy welding. Kennards Hire has complete welding kits, mould jackets for different rail weights and everything else you need to join, shear and grind away until you get that perfectly cast and ultra smooth rail joint. Whatever your welding, cutting or joining needs, your local Kennards Hire has a wide selection of tools available, as well as knowledgeable advice to help you on your way. Check in with your nearest store for hire rates and availability. Whether it's big or small, any construction job requires the right tools to put all of the pieces together. It doesn't matter if you're installing a door, putting together a cupboard or working on a large-scale rail project - you need reliable equipment that you can be sure will let your finished product be safe, attractive and long-lasting. Kennards Hire offer a range of nailing, stapling and fastening equipment at competitive prices no matter what the task at hand may be. Our screwdrivers, huck bolt systems and nailing and stapling guns will let you make quick work of any job, so you can get on with the rest of the project as fast as possible. If you're doing some construction work, carpentry or some DIY around the home, Kennards Hire can supply you with the equipment you need to fasten the parts together. It could be DIY or professional construction - whatever it is, speed and efficiency is the name of the game. We have nailing guns for a wide variety of applications and uses, that can help reduce your time spent on a framing, fencing decking and other, similar tasks. It wasn't too long ago that nailing pieces of wood together was a time-consuming and laborious process. You had to hammer each individual nail, which, while on its own did not necessarily take long, took up a great deal of time over the course of many nails. This was exacerbated by the toughness of the surface you were nailing the wood to - for example, if you had to drive the nail into a concrete wall, this would not only require more effort, it would take longer. Hours you could better spend working on other parts of a project or enjoying your leisure time were lost due to the inefficiency of a regular hammer and nail. With Kennards Hire nailing guns, this process is a matter of seconds. We have a variety of cordless nail guns, whether framing or finishing, that are light, easy to use and powerful. Our explosive nail guns are made for fixing timber to tough surfaces like steel, concrete and brick, while we also offer more compact equipment for confined areas. Same goes for our range of electric screwdrivers and screw guns. Gone are the days of arduously driving screws into walls, timber and metal, straining your wrists to painstakingly screw that final one in. Whether you're installing wall shelving, fixing roofing iron or attaching panelling, blueboard and plasterboard to timber or pressed steel frames, our electric screwdrivers and screw guns will make the task a matter of seconds' work. In addition to this, Kennards Hire has a variety of stapling guns for an array of different situations. Panelling, upholstery, carpet laying, fixing fabric to chairs - you name it, these stapling guns will make it a speedy, simple job. Kennards Hire doesn't simply offer equipment for those more small-scale projects. If you need an industrial strength and quality fastener to reduce costs and speed up construction, you'll want to look at our Huck Bolt Systems. As anyone who has ever worked around an industrial environment knows, the strength and reliability of the equipment is key. A loose bolt that undermines the structural integrity of a piece of equipment can jeopardise the health and safety of those who are using it, whether it's a vehicle or a walkway. Huck bolts provide a consistent clamp to minimise the possibility of a bolt failing to hold the joints together. Rail, truck, trailer, mining, even agriculture - wherever you need permanent, vibration-proof fixing for a joint, Huck Bolt Systems are your reliable, safe and clean alternative to welding. So whatever kind of fastening a project needs, get in touch with Kennards Hire and we will have the equipment solution for you.